Sorry, accidentally deleted old post. Reposted it. This node generates a regular polygon with rotation. I knocked this up rather quickly, but it does its job. 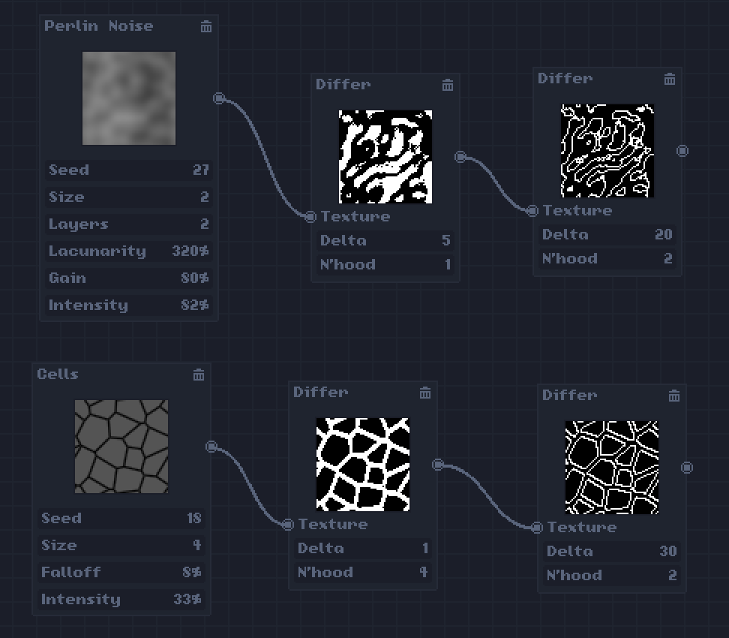 It's a poor man's edge detection node. 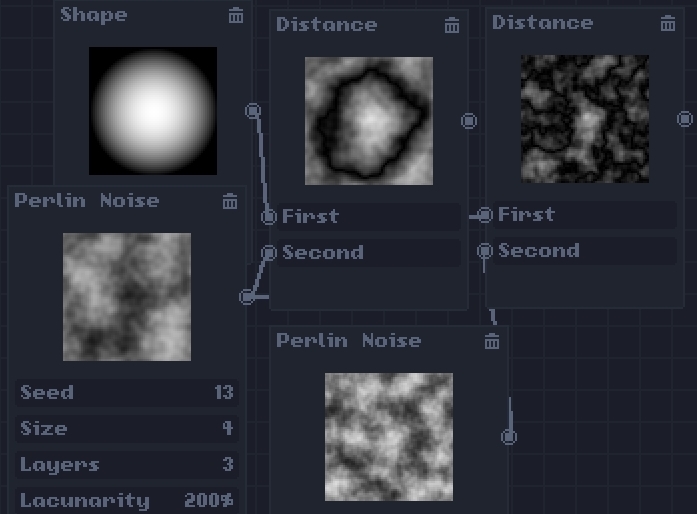 You can choose the intensity of the effect and one of three different neighbourhoods (Moore, Von Neumann and a 2D neighbourhood). There's also two variants of Moore (normal and "skinny", which removes one direction to provide a half-way house between that and Von Neumann) and two variants of the 2D neighbourhood (vertical and horizontal). The sensitivity is divided by three to give finer tuning, as quite often only the lowest values are particularly useful. Excellent thread. Loving all of your nodes. I might make some of these official! Here's a really simple one, but I've found it useful when checking to see how well images tile. It offsets your image by an inputted value. I'm not sure if it would be considered bad practice to use getTileSize() within init() to limit the fields, but it does seem to work. If you increase the size of the image while using Offset you do need to add a new instance to be able to offset by higher values, but nothing actually breaks. If it bothers you just replace the two instances of getTileSize() within init() with 64. Here's another simple one: Simple Color. 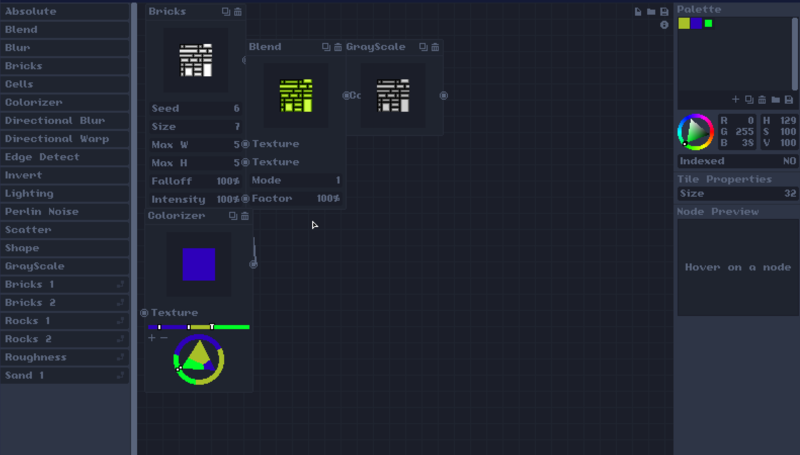 It takes RGB values and colourizes the image, which can be faster than using the existing colourize node when you just want shades of one particular colour. 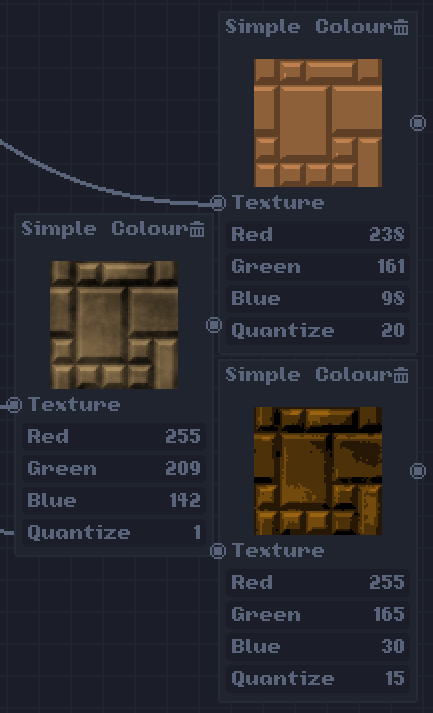 As the result tends to be a bit smooth for pixel art, there's a quantize feature which acts like a palette knife, cutting down the number of colours used. 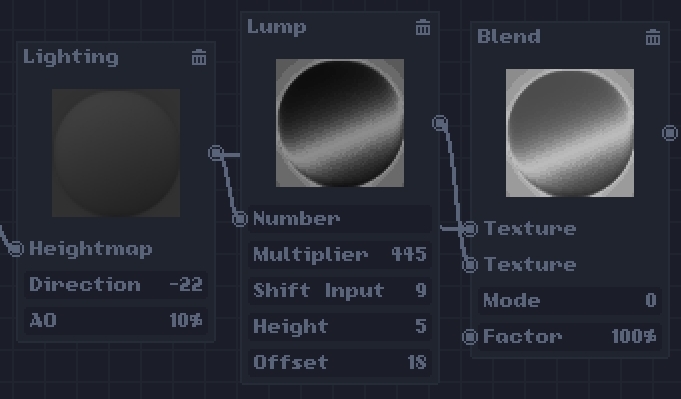 If you want, you can set all three RGB values to their maximum and just output a quantized heightmap. Since taking this screenshot I changed the spelling to the American spelling to match the existing nodes. 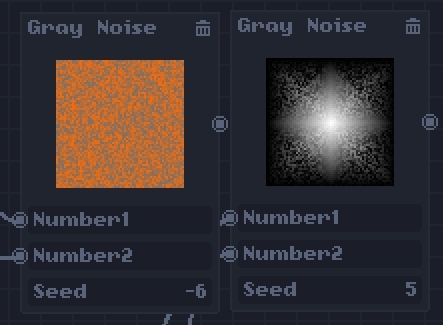 randomly mixes each pixel on the output between the two inputs. 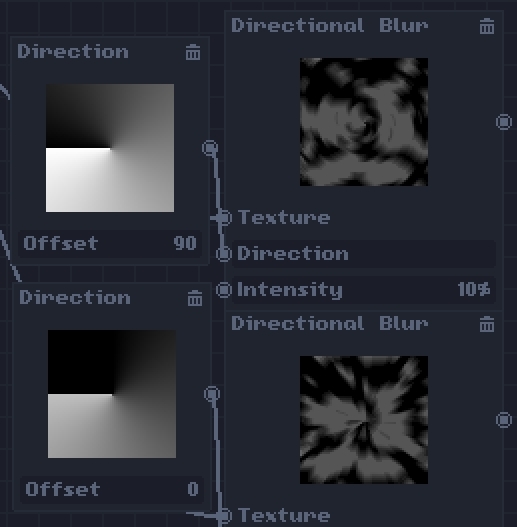 For use with directional blur. Makes each point point toward the center. Offset rotates these. 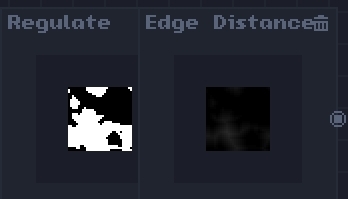 Makes the pixels be 'regular' as in regular polygons, snapping them to repeating values and also looping them after a certain value. This is basically just a neat way of rounding numbers thrown in with the modulo function. 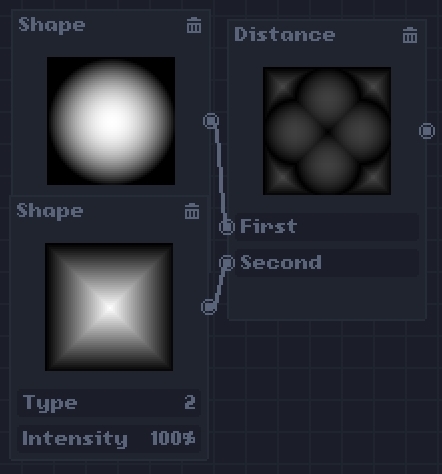 Gets the distance (abs(a-b)) between the two inputs. More hill shaped really, but lump sounded better. Linearly interpolates between two inputs, based on a third input. If t is 0, it returns the first one. If t is 1, it returns the second one. If t is anywhere in between, it returns a mix of the two inputs. Each input is an input parameter. 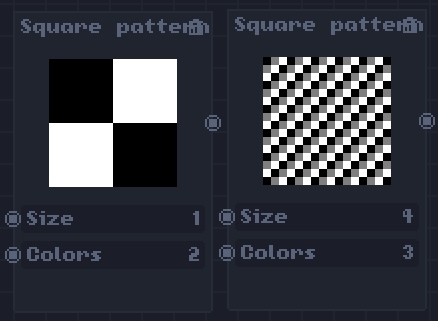 Gives a chessboard type pattern, with the option for more than two colors. 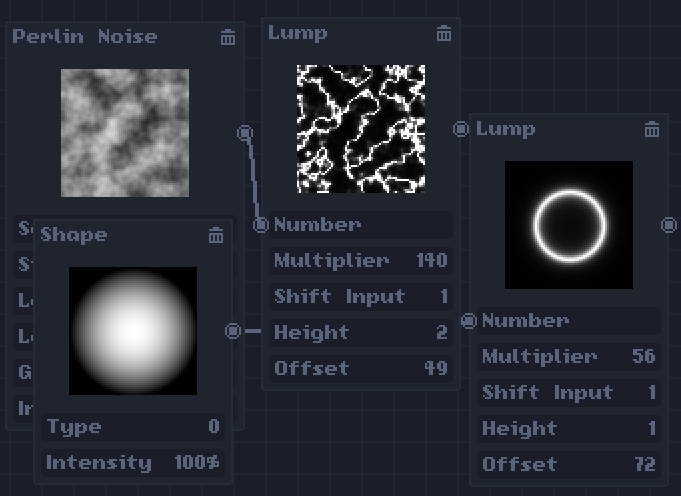 Due to a weird bug, the only sizes that don't have strange artifacting are numbers in 2^x, so the size input uses that. Been having fun with this tool, keep on accidentally calling it a game. Hope people find these useful! 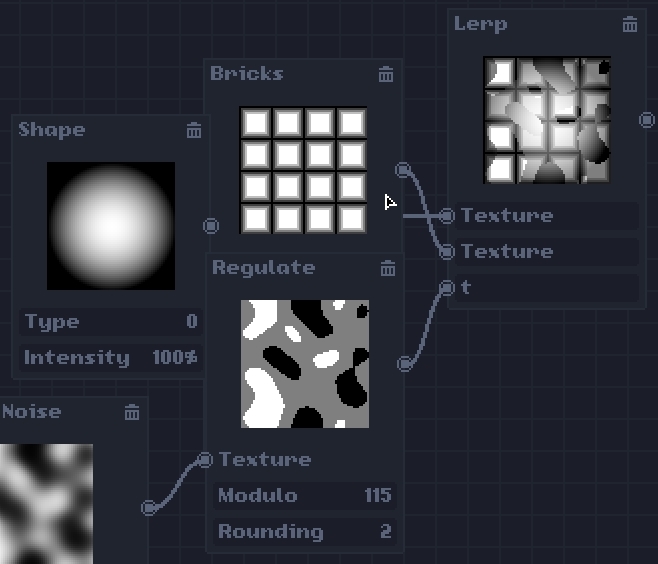 This raises up a texture by a heightmap. Not pictured is also an option to set whether it loops off the top of the image or not. 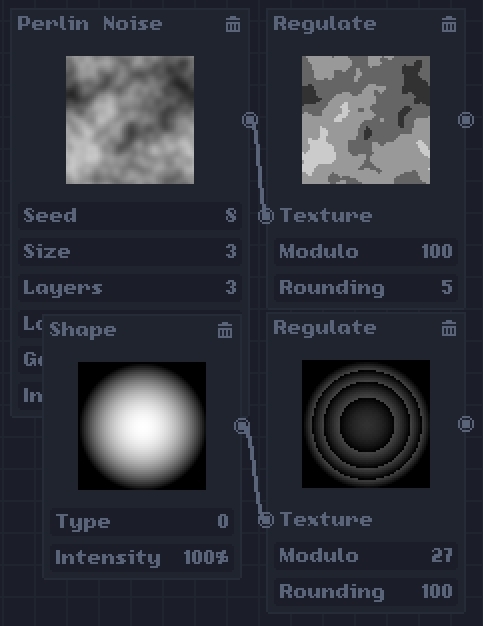 Good for visualizing heightmaps you make. 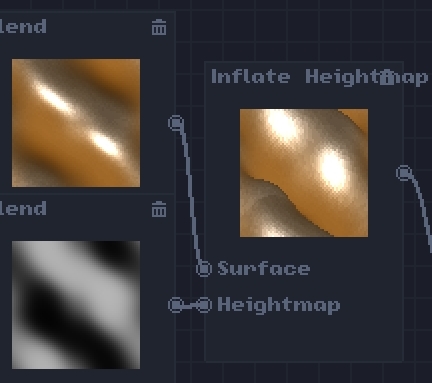 Note that without a surface input it will all be one color, shading just came from the lighting node. Don't know how often these would be useful, but I made these too. Turn on auto to automatically get the highest and lowest value, or you can fine-tune it manually. 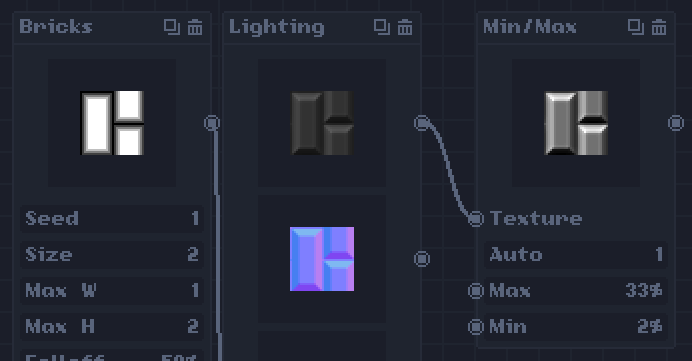 edit: Just noticed navot's brightness node already has a Min/Max. Oops.